Thirumangaialwar - 1090, 1206, 1524, 1660, 1760, 1852, 2016, 2050, 2674 (126). This Kshetra is also called as Pancha Sathya Kshetram. 'Sathyam' means 'Truth' or 'truthhood' and hence, this Kshetra is also called as 'Thirumeyyam'. Accessible from Thirumeyyam Railway Station, en route Trichy - Manamadurai line. Also about 12 miles from Pudukottai towards Karaikudi(bus route). 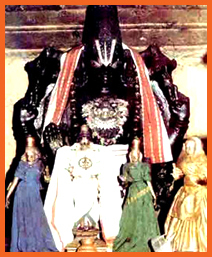 The Moolavar of this sthalam is Sathya Giri Nathan. Also named as "Sathya Moorthy". He is found in Nindra (Standing) thriukkolam facing his thriumugham along the East direction. Prathyaksham for all Sathya Devar and Devadhais. The perumal gives his seva in 3 different thirukkolam. First is the Sathyamoorthy in Nindra kolam, the second as Meyyappan in Sayana and bogha kidautha kolam. This divyadesam is situated in Pudukottai district in Tamil Nadu. It is situated 13 Km away from Pudukkottai on the south direction. We can reach this sthalam by getting down in Thirumeyyam railway station which is found in between pudukottai Karaikudi railway lane and has to travel one mile from Thriumeyyam railway station. Lots of Bus facilities are also available but there are no enough lodging facilities. malai (mountain).